By: Erin L. Brown, D.D.S. Budgeting money is tough, especially for parents with young children. The list of expenses seems endless and ranges from the basic necessities of food and healthcare to new soccer shoes or piano lessons to wanting an iPhone or Playstation. Where does getting to the dentist rank in your list of priorities? Ideally I’d couple it with healthcare and position it somewhere above needing new soccer shoes but perhaps below needing food to eat. It’s my belief, however, that it often lies just above the desire for an iPhone…and sometimes below it. It’s easy to put off dental treatment and checkups when you’re not having any pain, you don’t think you have any dental problems or just plain don’t like going to the dentist. I get it! 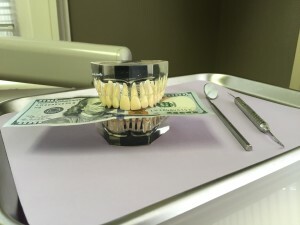 The dentist is not most people’s favorite place to be, especially when it is always seemingly associated with a big bill at the end. So how can you AVOID trips to the dentist, and more-so, how can you avoid large dental fees…the answer is simple…YOU HAVE TO GO TO THE DENTIST – ROUTINELY! Regular dental cleanings and check-ups (at least every six months) are essential for removing dental plaque (the white filmy stuff) and calculus (the hard deposits) from your teeth. Your dentist or dental hygienist can also evaluate your specific habits and conditions and come up with a plan for your oral health. Regular cleanings and adequate home care are essential for preventing dental diseases such as periodontal disease (destruction of the tooth-supporting tissues) and dental caries (cavities) that are the main causes of tooth-loss. Putting off dental treatment can lead to much bigger (and more expensive) problems. Delaying dental cleanings can lead to the progression of gingivitis to periodontal disease. Patients with periodontal disease require special treatment and often surgery to combat its progression. Failing to have dental caries restored in a timely manner can potentially lead to the need for root canal therapy and/or dental crowns. In both of these scenarios, opting to put off care can lead to more-extensive and more expensive fixes in order to maintain your teeth. And let’s just be honest here, it’s much easier to get your teeth cleaned than it is to get a filling and it’s much easier to get a filling than it is to have a root canal!! Preventive dentistry such as dental cleanings, dental radiographs, fluoride applications and dental sealants are ways to help prevent costly dental problems. As your dentist we want to assist you in setting goals and create individually-tailored plans to assist you in maintaining your teeth and preventing future dental issues. 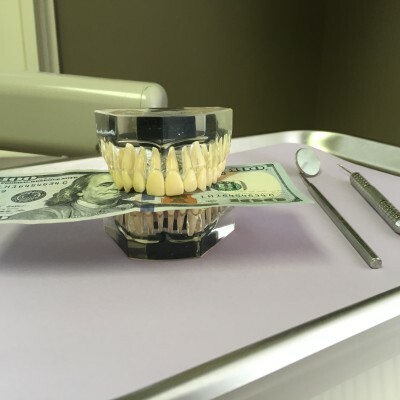 Putting dental work on the back burner may not just cost you a lot financially, but it may also cost you your teeth.